Being a large consumer of Energy with the additional requirement to be uninterruptable for the core plants, the laboratory have been always eager to use, test and experiment renewable and more efficient energy production technologies. 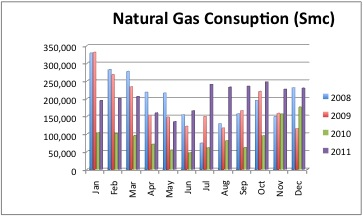 The facility electric energy and natural gas demands is increased in the last years to fulfill the FERMI FEL and their trends over the 2008-2011 period are depicted in the side tables. The Energy Management try to find state-of –the-art solutions to increase the energy efficiency of the laboratory, namely the rational use of the energy, and to minimize the energy cost. According to the Sincrotrone Trieste environmental and energy saving policy, we are now aiming at reaching a “zero carbon” energy system within ten years. This requires in the short term to optimize the use of energy, in terms of efficiency and mix of primary power, also to reduce costs and minimize the environmental impact, and, in the longer term, to install directly, and stimulate the installation elsewhere, of enough renewable power to offset the primary energy needs of the overall Laboratory. In this view, a first solar photovoltaic installation (19.95 kW) has been installed in 2007, in collaboration with the local energy Company, to acquire the necessary skills and data for further projects. To implement further this policy we will consider not only the internal energy needs, but also those of the surrounding Area Science Park facilities and of the adjacent territory. Therefore agreements with the other scientific facilities and Universities in the area and in Trieste will be pursued to develop common projects. To start along these lines within the FERMI project we provide a co-generation quota and the use of low energy consumption technologies, and a decision has been taken to install a trigeneration plant (CHCP: Cogeneration of Heating, Cooling and Power) capable to cover both the heating and cooling needs and the UPS power requirements. 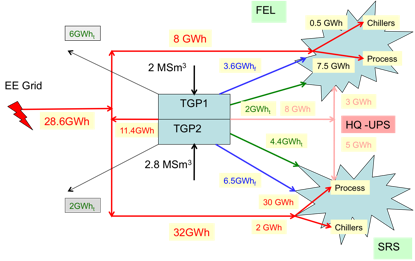 This system will use three 0.58 MWe generation sets run by gas engines (total 1.74 MW electric power) directly connected to the main FERMI electric supply line. A similar amount of heat will be available to be used directly in the heating plants (e.g. in winter) or, when heat will not be needed it will produce, by an adsorption chiller, cooled water to be used in the cooling plants (e.g. in summer). This plant will be designed as a no-break system and will be able to sustain the UPS electric loads during micro-interruptions or interruptions of the external electric power supply. In these cases, the system will be insulated from the FERMI electric net (island operation mode) and will supply the UPS electric power needed. During the transition phases of breakaway from, and parallel to, the FERMI electric net, the system will guarantee the very tight tolerances of voltage and frequency variation required. This plant, after a first commissioning period, is in operation at the nominal power from the end of June 2011. Meanwhile, has been decided to build a second twin trigeneration plant to support the energy demand of the Elettra SRS. This second unit is in advanced phase of construction and is planned to start its commissioning in February 2012. In order to maximize the energy efficiency of the laboratory, the two trigeneration units will be part of a unique distributed plant with a common control system which will take care to handle electric and thermal energy where it is needed. In the pictures above it is described the Energy Balance diagram of the laboratory.